Jakarta’s premier 5-star business hotel with lifestyle products takes urban escapes to a whole new level, warmly welcoming you to the world of AYANA hospitality. AYANA Midplaza JAKARTA is an urban sanctuary for your senses, where 21st-century amenities blend seamlessly with authentic Indonesian hospitality. Conveniently located in the heart of Jakarta's vibrant Jalan Sudirman central business district, AYANA is conveniently located within a 45-minute drive to and from Soekarno Hatta International Airport, as well as 2km from Plaza Indonesia shopping mall. The AYANA lifestyle ranges from lazy mornings in our luxurious city view suites, to lively sunset hour cocktail sessions at JimBARan Lounge. If you’re planning to host a wedding fit for the society pages, or merely want to thank your closest business associates with a customized appreciation dinner, our professional team is happy to accommodate you in our stunning Grand Ballroom or one of 24 conference spaces. Your sanctuary in the heart of Jakarta welcomes you home to unique signature experiences and AYANA's authentic hospitality. 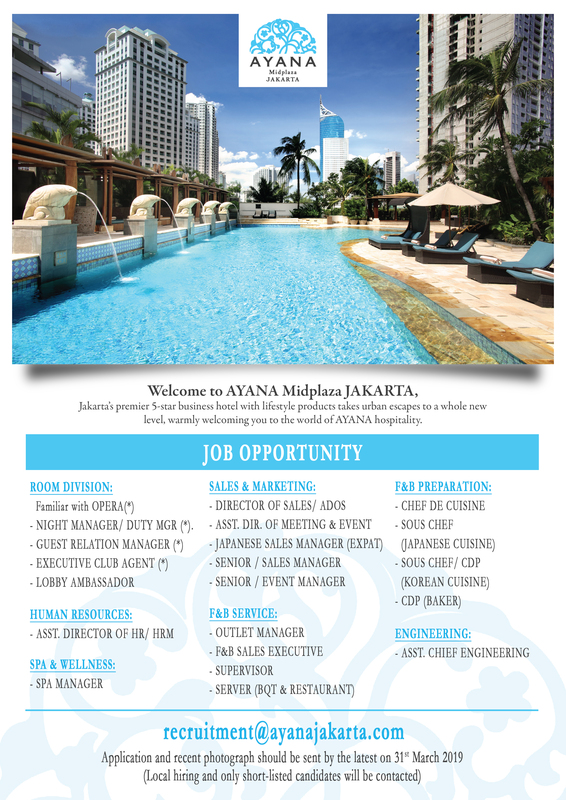 Designed to provide you with prestigious travel and lifestyle conveniences, AYANA Rewards offers you access to exclusive benefits and rewards at AYANA Midplaza JAKARTA and Delonix Hotel Karawang. Explore your opportunities and earn points for doing what you love – staying, dining, and relaxing. With every memorable business or leisure stay, you will automatically earn valuable points based on every qualifying amount spent. Host up to 1,500 of your closest friends and associates in our Grand Ballroom, where indoor sophistication meets outdoor garden delights. For your afternoon snack option, experience the best pair of Dammann tea and a selection of scrumptious sweets and savory snacks inspired by the story of Indonesian heritage at JimBARan Lounge. Don't sacrifice your taste for enriching vitamins and anti-oxidants. Allow our renowned Chef to show you valuable tricks of the trade to create yummy dishes at home that will have the whole family wanting more. MICE events are a key component in every company’s success and AYANA is ready every step of the way. Designed to host every event necessary for a successful MICE event, from exclusive meetings with the board of directors to extravagant incentive gatherings such as appreciation evenings and unique team building exercises. AYANA’s exquisite selection of indoor and outdoor event spaces will boost your company’s potential to achieve the most out of your next MICE experience.